Response to Instruction and Intervention (RTIi) provides a system for all students to receive instruction based on their needs, whether it is those needing intervention, students who are right on track, or those who require accelerated instruction. RTIi is a framework for any instructional subject, however in David Douglas we will be using it for Reading Instruction at this time. RTIi planning and exploration began in the 2010-11 school year, when our district applied for the Oregon RTIi grant. This grant provided a small amount of funding for trainings, but more importantly, provided the necessary technical assistance we needed for deep and effective implementation. During the 2013-14 school year, protocols and decision rules were developed for Tier 3 for elementary. 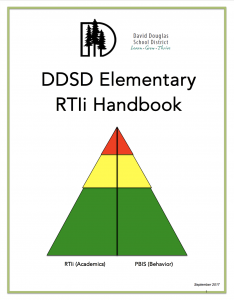 All RTIi protocols and procedures can be found in the David Douglas RTIi Handbook. The goal of RTIi is to increase the effectiveness of instruction so students achieve grade level expectations. Through the RTIi Framework, we can better work as a district-wide system to support adjustments in instruction to meet the needs of all David Douglas students. RTIi follows a simple plan of continuous instruction, screening, intervention, and monitoring of student progress. Core Instruction: All students receive high-quality reading instruction with Pearson Forward (K-5) aligned to The Big 5 components of reading, grade level expectations, and Common Core State Standards. Students needing intervention are not pulled from their 90 minute reading block to ensure that they are given access to differentiated grade level instruction. Universal Screening: All K-5 students’ reading skills will be assessed three times per year in order to review the effectiveness of core instruction and make adjustments accordingly. This will also indicate students needing intervention or acceleration. We use DIBELS Next as our Universal Screening Tool. Intervention: Students needing reading intervention to accelerate towards grade level expectations are given an additional 30 minutes of targeted intervention outside of their 90 minute reading block. Progress Monitoring: Students receiving Intervention are assessed often with quick DIBELS Next measures to determine their response to the implemented intervention.